Just settling in after a long, busy, fun filled weekend in Minnesota. It was a million mile whirlwind tour, but between seeing family and getting Sarah moved into college, it was a great close out to summer. Here's a few highlights. We spent the weekend with our sister in-law and her daughter. Jane just moved into a new home in June, and it is beautiful. We always enjoy our time with her and her girls and their dog, Chai. They make us feel completely welcome and comfortable, and we are so blessed to be part of their lives. We stayed up late on Friday laughing and catching up with Jane. Quality time with beautiful people. Saturday was spent getting Sarah moved in to the University dorm at the U of M. It was eventful from the start when I got pulled over by a U of M cop for driving in a bus-only zone. She was nice enough to let me off with a warning ticket. Of course, I explained to her that when I was a student we were allowed to drive the entire length of University/Washington Ave. Needless to say, she was not impressed with my historical knowledge, but the fact that I was an alumni (with Wisconsin plates, no less) might have had a bearing on the verbal warning. The rest of the move went off without a hitch. Her new dorm/apartment is really nice and she seems very happy. Great roommate too. When we said goodbye for the last time on Sunday afternoon, there were the usual tears, but not as bad as last year. She has a solid friend base on campus and is plugged into a couple of groups, so she will be fine. Can't really compare her experience to mine at any level, but I am very proud of all she's becoming. Before this trip, I'd never been to Ikea. Now I have. Meatballs and madness. Don't much want to return. On the way to go out to dinner on Grand Avenue, we did a drive by to check on my old house. Needless to say, I was shocked to see that our front porch is gone. To me it was the focal point of the outside of the house and gave it so much character. My only hope is that the current owner is planning on rebuilding a new one. It looked like they have started something deck-like, so it is possible. In any case, it almost made me sick. Dinner in the old neighborhood. We had dinner at Punch Pizza on Grand Avenue, about a mile from where I grew up. Grand Avenue has changed dramatically as well, but it felt good to be back in the area. 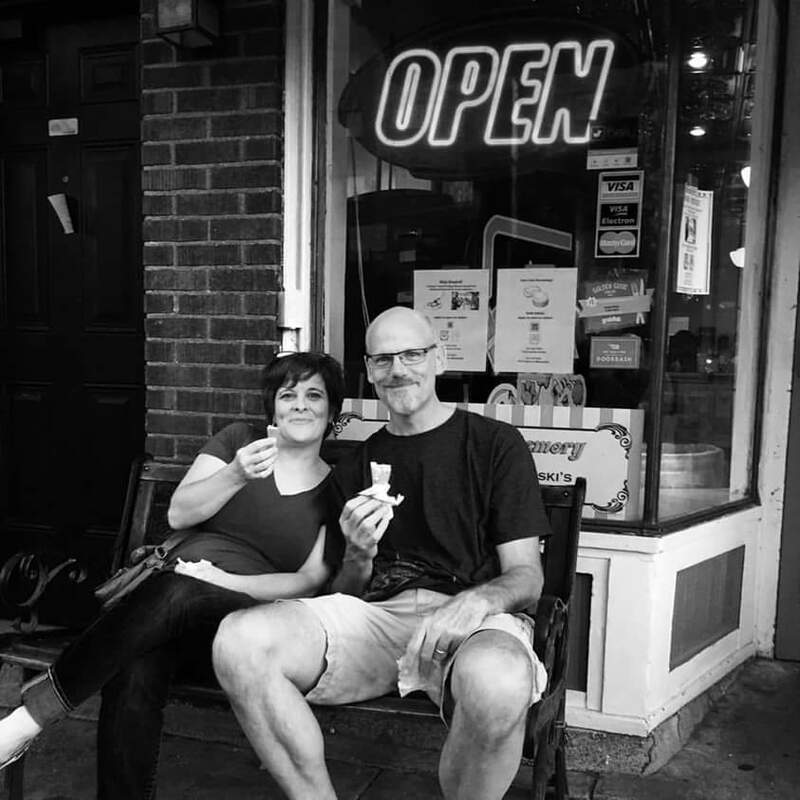 After dinner we had ice cream at the Grand Old Creamery. 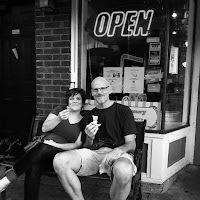 Once I gained control over the melting mass of ice cream on my cone, it was as good as I remember. I miss that old neighborhood. 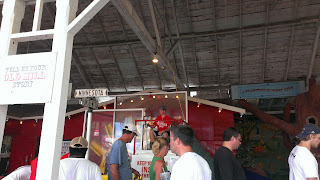 Went to the Minnesota State Fair on Sunday afternoon. It was a sea of humanity as always, and absolutely perfect. I convinced Donna and Sarah to ride the "Ye Old Mill" (aka the tunnel of love) with me because, well, because it's a must-do state fair thing! They were both a little creeped out by how dark it got, and we all got a chuckle out of the brightly lit "Exit" signs that point the way out. (Like anyone is going to get out and walk their way to the exit.) They were good sports in humoring me about going on it and now Donna said she can check it off her list. And, though Donna and I kissed once, we managed not to "make out" in front of our daughter. Great restraint we have. 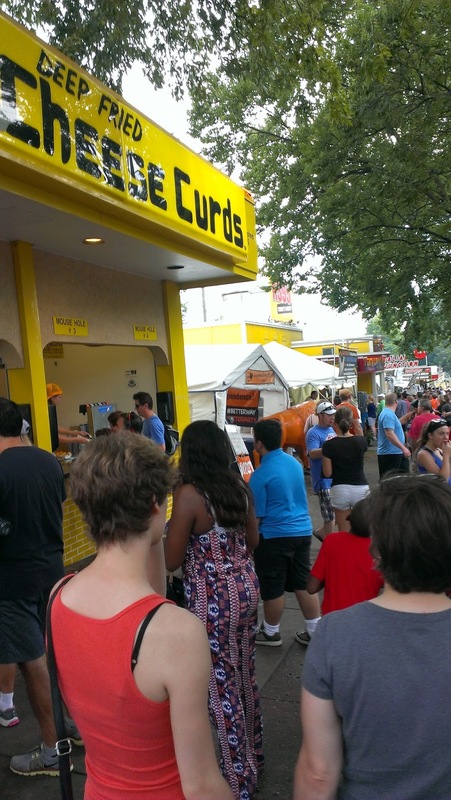 The rest of the fair was a series of gorging and walking. Pronto pups, Tom Thumb donuts, Cheese Curds, beer, soda, pretzel, and a twist cone at the Dairy building. While I was there, I dropped a card and mentioned Dirty Shirt at the Save the BWCA booth. Always the Dirty Shirt ambassador, ya know. Yup. We finished out the day on Sunday with our family at my brother's house. He was recently in Europe and had a slide show of pictures. He also managed to bring back mugs with Landwehr-Brau inscribe on each. The Landwehr Brewery was in Reichelshofen, and he had the chance to tour it. On our way out of town, we stopped at my nephew's house in River Falls, WI. He and his wife just bought a beautiful new house and are happy new homeowners. It may end up as my "bed and breakfast" on my upcoming western Wisconsin book tour. So, a great Labor Day weekend. Quiet and normalcy are back at home and I miss my daughter already. In looking back at the weekend, I realize again how privileged I am to have the kids and extended family that I do. They make my life rich, happy and blessed. I hope your Labor Day was as enjoyable as mine.